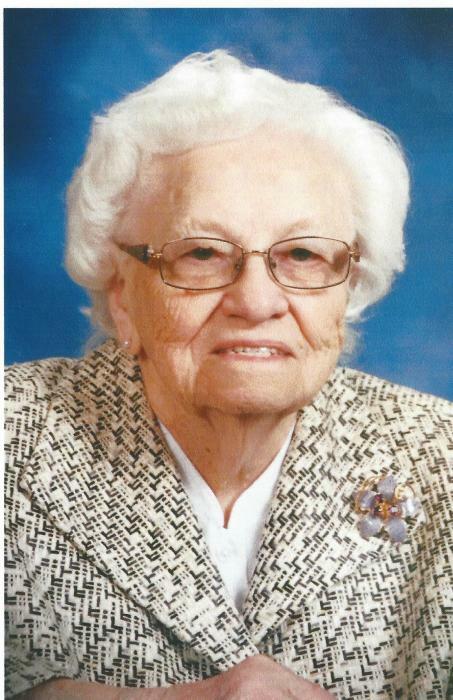 Gertrude (Bos) VandeBrake was born on December 22, 1918 to Henry and Gertrude (Bakker) Bos in Maurice, Iowa. She was the seventh child of nine children. Gertrude Married Cornelus VandeBrake on February 8, 1939. They were married 64 years. They moved to Hollandale, Minnesota soon after their marriage. Cornie worked for Hollandale Produce Company and Gert was a homemaker. Together they raised three children. In 1999 they moved to Denver, Colorado to be near their children. In 2003, Cornie was called home to his Savior. Gert remained living at Clermont Park in Denver. On May 8, 2018 Gert, moved to The Suites at Clermont Park and died on July1, 2018. Gert's time at Clermont Park was taken up by hours of volunteer work. She embroidered tea towels for sale at the Clermont Park Gift Shop. She sewed hospital gowns and lap robes for the residents at the nursing home. She made quilts for her children, grandchildren and great grandchildren. She did mending for residents of the nursing home while attending the Sewing Club at Second Christian Reformed Church. Gert is survived by her three children, Gary (Shirley Jacobsen) VandeBrake, Dorothy (Mark) Rietema, and David (Eunice Beckon) VandeBrake, six grandchildren, and seventeen great grandchildren . Gert's eight siblings and her parents preceded her in death. Henry Bos (Elcena), William Bos (Lydia), Peter Bos (Esther), Wilhelmina (Garrit) Hartog, Alice (Gerrit) Koldenhoven, Christine (Richard) Koldenhoven, Nell (Joe) Koldenhoven, Winnie (Gerald) Mulder. She is survived by sister-in-law Esther Bos from Orange City, Iowa. We are thankful that our Mother was a woman of faith and taught us always to look to Jesus. Graveside services will be held at Fort Logan National Cemetery on Tuesday, July 10, 2018 at 12:15 p.m. (staging area "C"). Family and friends are encouraged to share stories and photographs of Gert here on her website (click "Tribute Wall" tab on the top of this page).